About us - Aunt Goodiebags! 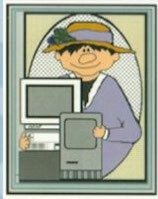 Aunt Goodiebags is a character that lives in the computers and other gadgets and Dr. Nancy Smith is... me. We are in Syracuse, NY. This website has been a challenge and is still in production. I used to write the page in HTML... that was fun and kind of magic. Then I had to use Apple's iWeb when AOL stopped hosting web pages. Another thing to learn. Then when Apple abandoned us... we moved to Jimdo.com for hosting. Jimdo (my web hosting/design site) is great. BUT it is another learning experience for me. 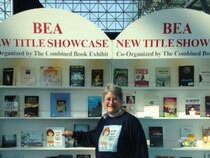 made it to the Book Expo in NYC a few years ago!! The book was RIGHT IN FRONT in the display area! Looked good!